PCR is a technique that uses the two matching strands in DNA to amplify a targeted DNA sequence from just a few samples to billions of copies within just a couple of hours. 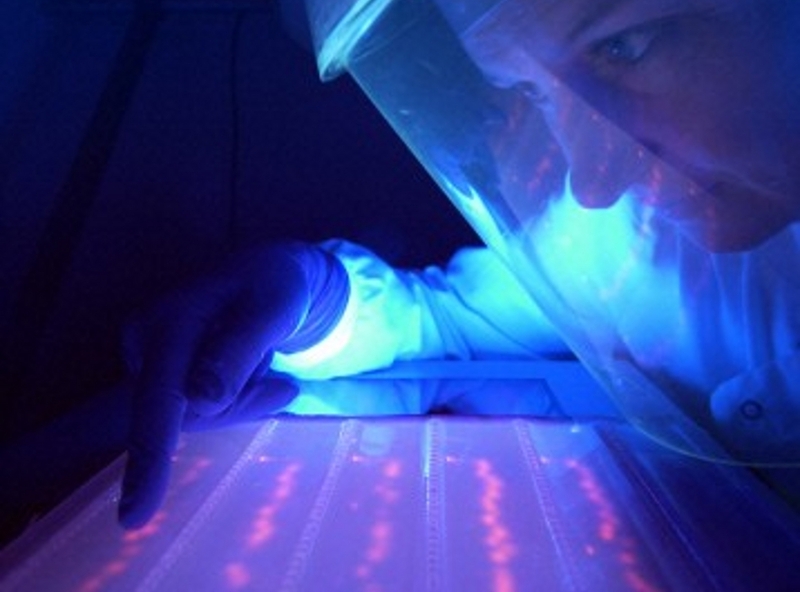 The photo shows a scientist studying a DNA band under UV light which has been created using PCR. Credit: Pablo Rojas, Wellcome Images. PCR has radically reduced the time and number of steps required to create large quantities of DNA for use in multiple applications. Where it has had some of its most profound impact has been in the diagnostics field. Importantly, it has increased the speed and accuracy of diagnostics. PCR is instrumental, for example, in the identification of small DNA sequences involved in cancer and genetic disorders, such as cystic fibrosis, and cancer, and for the identification and diagnosis of diseases caused by fungi, bacteria and viruses. PCR is not only used in healthcare, but is an invaluable tool for analysing ancient DNA and understanding biological evolution and for agriculture where it is used to improve the resilience and output of crops as well as animal livestock. PCR also underpins genetic fingerprinting in forensic science. As early as 1953, when James Watson and Francis Crick first unravelled the structure of DNA at Cambridge University, they hypothesised that one day it would be possible to copy genetic material. Three years later Arthur Kornberg, based at Washington University St Louis, identified and isolated DNA polymerase, an enzyme that replicates a cell's DNA. Following this, in the early 1960s, H. Gobind Kohrana, an Indian-American biochemist based at the Massachusetts Institute of Technology, found a means to synthesise DNA oligonucleotides, short bits of nucleic acids vital for artificial gene synthesis. In 1971 Kjell Kleppe, a Norwegian researcher working with Kohrana, came up with the founding principle for PCR. He suggested bracketing a targeted DNA sequence using a pair of primers, strands of nucleic acids which serve as the starting point for DNA synthesis, and then copying the sequence using DNA polymerase. This idea was to become much easier to put into action with the development of techniques to sequence DNA by Fred Sanger at Cambridge University in 1977. The first practical demonstration of PCR was achieved by Kary Mullis in 1983, who tested the technique as part of a project to understand the genetic cause of sickle cell anaemia at Cetus Corporation. Mullis, however, struggled to replicate his initial success, because the polymerase he chose for the operation kept being destroyed by the high temperatures ((95 centigrade) required to split apart (denature) the DNA strands at the start of each replication cycle. He resolved the matter by the adoption of another polymerase in 1985. This was a polymerase isolated from a species of bacterium Thermus aquaticus (Taq) discovered at a hot spring in Yellowstone National Park by Thomas D Brock in 1969. Importantly Taq polymerase proved able to withstand the high temperatures required to break apart the DNA strands at the start of the PCR cycle. In 2000 a group of Japanese researchers led by Tsugunori Notomi published a new DNA amplification method which was much simpler and less expensive than PCR. It is called loop mediated isothermal amplification (LAMP). It has the advantage that unlike conventional PCR, it does not require the use of a thermal cycler because it amplifies DNA in a single reaction at a constant temperature. This is achieved by using a polymerase with built-in strand displacement capacities, which eliminates the need for the high-temperature denaturation step undertaken in PCR. Another point in its favour is that, unlike PCR, it does not need a separate method to analyse the product. This is done either through the use of real-time fluorimetry which enables visual detection during amplification or a post-reaction analysis using manipulation like electrophoresis. LAMP also produces considerably larger amounts of DNA than PCR, up to 50 times more, and it can be used to amplify RNA and microRNAs. Just how much of an improvement the new technique has made can be seen from the fact that LAMP was mentioned in 2000 publications between 2000 and 2017. This included article in areas all the way from infectious disease, food safety, clinical diagnostics, agricultural testing through to livestock breeding. PCR is used for a wide range of applications in science, industry, medicine, agriculture and conservation. In health and medicine it is used to advance our understanding of cancer and human genetic diseases, such as cystic fibrosis and Parkinson's. PCR is also important to the genetic identification of fungal, bacterial and viral disease. It is used, for example, to detect gonorrhoea and chlamydia in urine samples. PCR also helps determine maternity, paternity, and other blood relationships and is used by forensic scientists to identify individuals based on their genetic profile. The technique also gives scientists the means to hunt for similar genes scattered throughout different species or populations to determine the evolutionary distance of related species and to amplify ancient DNA isolated from samples of extinct animals. PCR is also vital to conservation work, helping to prevent the inbreeding of captive animals and to identify the origin of illegally obtained ivory. The technique is also used in agriculture to determine plant species, pests and diseases. One of the limitations with PCR is that it requires equipment and infrastructure that are difficult to shift around with the user. Some of these problems are being overcome by the adoption of the LAMP technique which is easier to carry out in the field because it needs less complex and less expensive instrumentation. It also has the advantage that it can amplify DNA from partially processed and/or non processed samples and is extremely fast. LAMP is now a widely used molecular diagnostic method and stands at the forefront of the point-of-care diagnostic revolution. Due to its simplicity, low cost, low-energy consumption, ease of learning and robustness, LAMP is proving a useful diagnostic and detection technique for screening for infectious diseases in low and middle-income countries. Since 2005 it has begun to be used in screening programmes for malaria, tuberculosis and sleeping sickness. The method was also recently used to detect the Ebola virus. Trials are now underway to see if LAMP could provide a tool for the rapid detection of meningitis, the speedy treatment of which is currently hampered by the difficulty in identifying the disease before infection overwhelms the body.